The desire to ‘leave no one behind’ permeates the 2030 Agenda for Sustainable Development and is expected to spur demand for global monitoring and reporting of inequality. The GEM Report addresses three main issues: what are appropriate ways to measure inequality and its evolution, how to collect information identifying individuals as members of vulnerable groups, and what broader aspects of equity in education can be measured, beyond parity. Three main factors complicate measurement of inequality in education. First, inequality can be examined with reference to a wide range of indicators with respect to, for instance, access or learning. Second, different inequality measures can be used to see how an education indicator is distributed in the population, each with advantages and disadvantages. Different measures can lead to different conclusions about the degree of inequality and change over time. Third, policy-makers need to know how an indicator varies by individual characteristics, such as wealth, but it is often difficult to compare these characteristics across countries. The Inter-agency and Expert Group on SDG Indicators has proposed the parity index as the global measure of inequality in education. This measure is the easiest to communicate to a broad audience and has been effective in describing gender disparity for two decades. Among the characteristics it can be applied to, disparity by wealth is the most extreme. 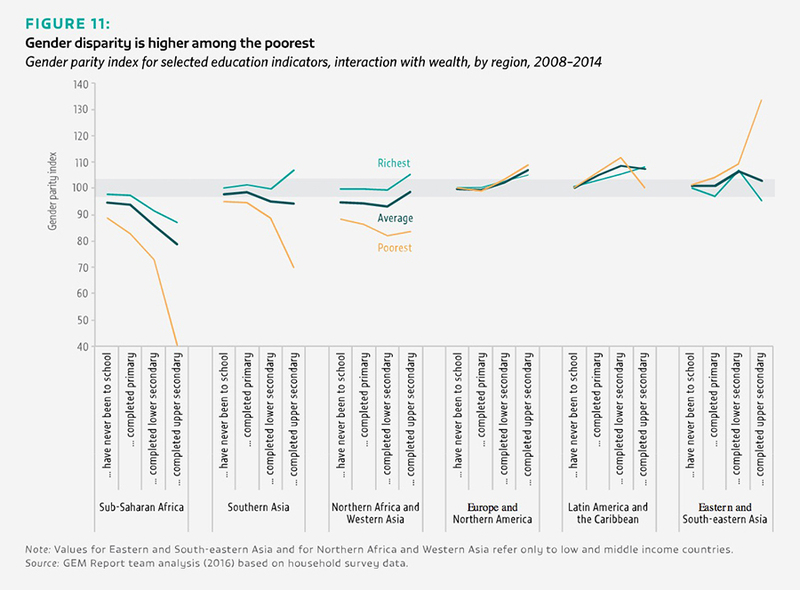 In upper middle income countries, the wealth parity index of completion rates is 0.90 in primary education, 0.71 in lower secondary and 0.44 in upper secondary. In low income countries, the wealth parity index is 0.36 in primary education, 0.19 in lower secondary and 0.07 in upper secondary. The establishment of the Inter-Agency Group on Education Inequality Indicators is a step in the right direction as it enables consistent analysis of survey data and pooling of untapped data sources. Progress at the global coordination level needs to trickle down to the country level. Parity was achieved globally in 2014 in primary, lower secondary and upper secondary education, though only 64%, 46% and 23% of individual countries achieved parity at the respective levels. National averages, moreover, mask disparity within countries and among particular groups. Sub-Saharan Africa reports gender parity of those who have completed primary education among the richest 20%, while among the poorest 20% just 83 females per 100 males completed primary education. The disparity widens to 73 females for lower secondary and 40 for upper secondary. Adoption of the parity index to monitor gender aspects of target 4.5 extends its use beyond enrolment ratios to all education indicators, including learning outcomes. While this is positive, the index addresses only one of several domains in gender equality in education. To improve monitoring of gender equality in education, efforts need to focus on collecting more comprehensive data on gender aspects of curricula, textbooks, assessments and teacher education; and closer links are needed between those working on gender equality indicators in education and more broadly. Determining progress on equal access to education for people with disabilities requires an internationally comparable measure of disability, yet disability takes diverse forms. By one measure, across 30 education systems in Europe, 3.7% of compulsory education pupils were identified as having a special educational need in 2010. UNICEF and the Washington Group on Disability Statistics are leading efforts to develop an operational measure of disability. It is also important to monitor whether educators are well prepared and school infrastructure adapted to address the needs of learners with disabilities. The continuing neglect of mother-tongue-based multilingual education helps explain large disparities in education outcomes. More efforts are needed to monitor language policies in education. By one measure, about 40% of people around the world lack access to instruction in a language they speak or understand. Monitoring national policy documents cannot provide information on whether students have access to teaching and learning materials in their home language, teachers are prepared or official policies are implemented on the ground. In the Mopti region of Mali, only 1% of primary schools provided bilingual instruction in the appropriate language and by a trained teacher, despite national policy. Despite problems accommodating domestic rural migrants, who often move into slum or peri-urban areas with limited public school access, migration to urban areas generally facilitates access to public services. In the case of international migrants, the challenge for policy-makers is that these students tend to be concentrated in schools in disadvantaged areas. The main challenges concern the forcibly displaced. Internally displaced people remain relatively invisible. In 19 of 42 displacement camps in 6 states of Nigeria in June 2015, children had no access to formal or non-formal education. Refugees are the most vulnerable group: 50% of refugees at primary school age and 75% at secondary school age are out of school worldwide. Monitoring the education status of migrants and forcibly displaced people is difficult. Coordinated efforts need to be stepped up to better understand the reasons for the disparity in their access to education.